Dust off your Lederhosen, starch up your Dirndl and join the happy folk in Mount Angel for two fun days of celebration in honor of the WURST! Wurstfest: A Mount Angel Celebration of German Sausage returns to Mount Angel for a third year. 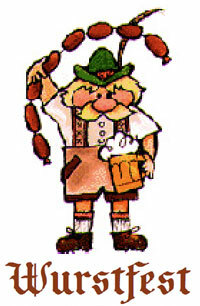 Wurstfest was dreamed up in 2009 by the Bavarian-phile merrymakers in Mount Angel, Oregon, home of Oregon’s largest Oktoberfest celebration every fall. Heather and I attended the inaugural festival and enjoyed it immensely – it’s just like Oktoberfest, but in the winter. Mount Angel area sausage makers present their best wursts at the fest, authentic German beers are on tap, and regional wines and Bavarian glühwein is available. Entertainment includes Oktoberfest-style music and dancing. The fest takes place at the Mount Angel Community Building (500 S Wilco Highway) on Saturday, February 12 and Sunday, February 13. Hours are Saturday 11am until 11pm, and Sunday 11am to 5pm. Included in the $10.00 adult admission fee is a souvenir glass Bavarian beer mug (for first 2000 attendees). Kids get in free with an adult until 9pm. This will be your last chance to celebrate in the old beer hall! Demolition of the Biergarten and construction of the new Mount Angel Community Center begins shortly after Wurstfest. Happy Birthday Dear Oregon from Mile73 on Vimeo.